The Scout by Eco Vessel is a sturdy and lightweight kids water bottle and it fits in most lunchboxes and cup holders. It features a flip spout for no tilt drinking making it convenient whether kids are playing sports, video games or reading. The BPA free Scout Kids Water Bottle has unique and one of a kind designs and a style that your kids will love! It is made from a thicker stainless steel and more durable paint than other single wall options, so the Scout will hold up to the drops and falls that are sure to come along with your child's active lifestyle. The straw top is easy to drink from, without the danger of large spills. The non-removable TPR (thermoplastic rubber) straw is a recyclable, Earth-conscious material that is designed to withstand bites and tears in many conditions. Care: Hand wash with warm soapy water and air dry; white vinegar and baking soda work well for a more thorough cleaning. NOT dishwasher, freezer or microwave safe. CAUTION: Spout could pose a choking hazard if chewed, bitten or comes off. Please check the spout every time it is used to make sure there are no rips, tears or damage and it is securely attached. DO NOT USE if there is any damage to the spout. NOTE: the spouts are NOT removable on these bottles. If a spout comes off, STOP using. Replacement tops for the kids' bottles are available at www.ecovessel.com. My son was thrilled to have something that is not an off the shelf water bottle. The edgy skull and bones did the trick for him and it is highly useful. Great product. Cool bottle with really nice designs. Extra thick steel that can withstand my son's frequent drops. The flip straws do not leak as long as they are down and they are easy for little ones to use. The item arrived promptly and functioned as described on the site. It was a little larger than I expected, but it does hold a full 13 ounces, so I should not have been surprised by the size. yay for non-plastic baby/toddler travel cup! The prints on it rub right off and had to toss it after a few months, because the part with the threads on it, was popping right off too. :-/ We did like it while it lasted, but too expensive to buy for that short amount of time. This bottle is really cute and I wanted to love it, but it just didn't work for us. I know it is not leakproof - but it didn't leak just a little, it would soak everything in our bag if it was tipped at all. The coating on the outside also scratched really easily, which was disappointing given the price. I loved everything about these water bottles, but they leak. We bought two and both leak. 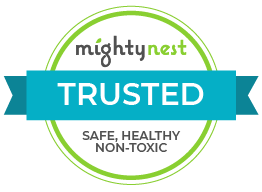 When I contacted MightNest about the leaks, assuming I had defective bottles, I was told that they were never sold as leakproof. (Silly me in assuming that $17 bottles shouldn't leak!) Otherwise they are perfect. So sad. Eco Vessel is based in Boulder, Colorado at the base of the Rocky Mountains. They are dedicated to developing products from safe, sturdy, sustainable materials while offering innovation and practicality. The complete product line provides options for both children and adults with all of these in mind. You can feel secure knowing that they're 100% recyclable, BPA Free products are made of high quality, non-leaching materials and are designed for your safety, ease of use and convenience.